Accommodation plays a role in your overall trip experience. Whether you’re staying at your hotel/hostel/guesthouse/b&b/resort the whole day or just sleeping there, it would still impact how your general feeling about the place. I guess one of the reasons why I enjoyed my Donsol trip so much was because of the overall feel and the lovely people at the Amor Farm Beach Resort. 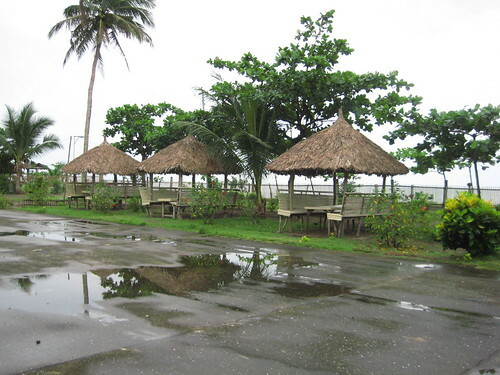 One of Donsol’s first resort, Amor Farm Beach Resort is listed as Lonely Planet as its second choice. LP describes Amor as: “right next to the vistors centre, this is a peaceful place, albeit not quite as well kept as Woodland.” They’re right about it being a peaceful place, but it seems the tourist center has moved, because it’s now a 5-minute walk from Amor. 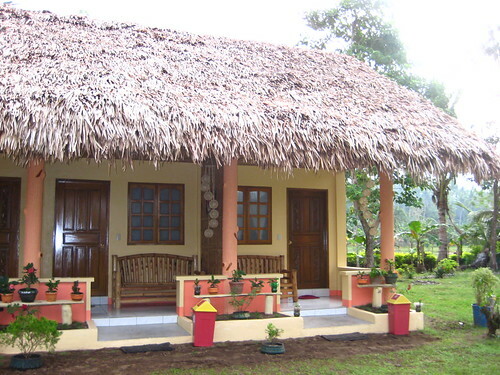 The resort is very rustic, very natural and very Filipino. The cottages have thatched roof, the rooms are spotless and the staff are very friendly. The resort is filled with greens, save for the basketball court (which used to be a place to dry their palay). Amor also has a restaurant serving good Filipino and western dishes at reasonable prices. Left your book at home? Amor has some reading materials you can borrow. Amor’s restaurant also serves as the resort’s common area. There is a TV (which seemed to be always tuned to ABS-CBN — kapamilya sila! ), a a component (for videoke, perhaps? 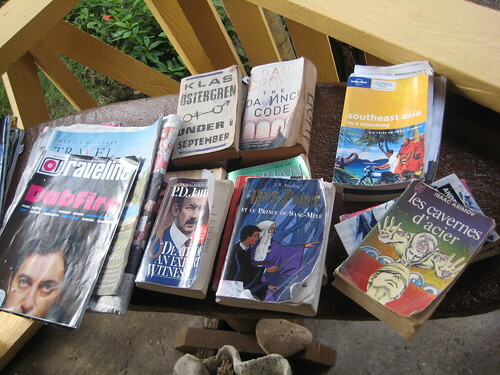 ), a table laden with books and magazines from around the world (Harry Potter in French, anyone?). If you’re traveling alone and looking to chat up with other travelers, just hang out at the restaurant and you’ll surely find someone to talk to. The ever wonderful Agnes who welcomed us with open arms *drama* It’s really the people at Amor that made this stay so enjoyable. Being listed in the Lonely Planet Philippines meant that most travels head to Amor Beach Resort when traveling in Donsol. If you’re going during the peak season (December – May for Donsol), better book a room beforehand because they fill up very quickly. When we were there, a room would only be unoccupied for less than an hour (just enough time for the housekeeping crew to do their job) before a new guest would settle in. Amor is the accomodation of choice for plenty of travelers who has gone butanding watching in Donsol. It’s also my choice. It’s called a “beach resort.” Is it actually on the beach? What is the nearest beach like? 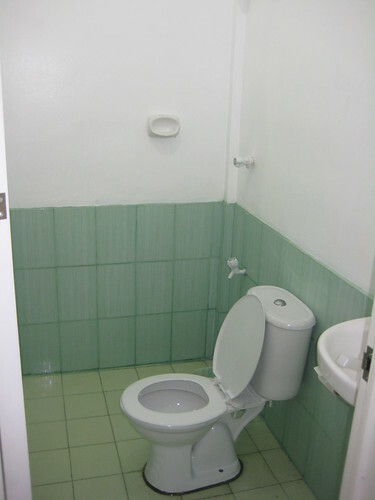 Do you have a photo of a typical room (other than the bathroom)? Less than $40 USD for a thatched-roof room with no TV near the beach sounds GREAT to me! I’d love to spend a week, or two, there! It’s a beach front property, but I didn’t take a photo of the beach because…well, let’s just say no one really goes to Donsol for the beach There’s a photo of the room in my flickr. gusto ko bumalik sa albay!!! Half of $40 sounds even better! But with the dollar plunging in relation to pretty much every currency in the world… you’ll be planning your next vacation to the USA! hello… me and my friends are planning to go there…do you have any contact numbers for point persons of fireflies atching.and also for other resorts aside from listed above….all rooms are fully booked already.would really appreciate your help on this..thanks..
Hi Ai! 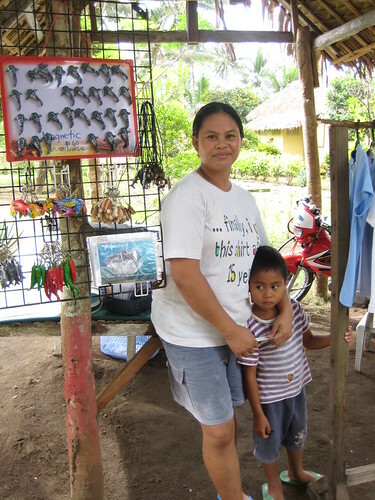 The firefly tours are organized by the resorts mismo. Just ask the people at your resort. You can find a list of other Donsol accomodation here. Babalik ako sa Donsol this comming summer, miss ko na sa Amor Farm. Kumusta na kayong lahat dyan sa Amor Farm. The best place to stay is at Amor Farm. Babalik ulit ako sa Donsol ngayong darating na Summer. my girl friend and i, we come to donsol at 04.04.2008 and want to stay till 08.04.2008. Do you maybe have a nice room for us? We spent 4 days in Amor beach ressort. It’s a quiete place, close for seing “butanding”. We are trying to make a booking to Amor resort, but we can not find a email adress or something. Hi Rai, the room rate is per day. If you will come with your friends you can split the rate into 3 , as the maximum pax per room is 3 (1,800/3 = 600.00php per pax) But if you are just alone, you will need to pay for the room/day rate. my friends are planning to go there? thank you nina for sharing and for having this blog….such a big help…. happy traveling! !